What starts out as a heartwarming, but tragic, story, loses itself half way through and becomes so much less than it potentially could have been. Anyone would be lucky to have a Mr. Church in their lives and for Susan McMartin (Mom) it was reality. Based on her true story, Mr. Church was the only father figure McMartin had ever known and became more than just an employee to her. To her, he was family. The movie that unfortunately didn't fair very well at the box office comes to Blu-ray and DVD this week. Charlie (Britt Robertson, Tomorrowland) was the only child of Marie (Natascha McElhoe; Californication). Her father wasn't interested in Charlie but gave Marie money to support them both. When Charlie was ten years old, Marie developed breast cancer and was given 6 months to live. Charlie's dad, before he passed, paid for a cook to come and take care of Marie and Charlie until Marie passed away. Somehow, defying the odds, Marie lived 6 years instead of 6 months and the short-term cook became a fixture in their lives. Mr. Church was a talented man. He could cook anything you wanted, played piano and was an avid reader. He was also dependable yet secretive. He showed up at Charlie and Marie's every morning and left after dinner every night. Charlie, who as a ten-year-old girl was unaware of her mother's fate, resented his presence. By sixteen she looked to him for guidance and comfort. The big surprise of Mr. Church is Comedian/Actor Eddie Murphy (Beverly Hills Cop) in the title role. He has rarely taken on more dramatic characters, preferring his tried and true lovable and laughable ones, but he manages this part with subtle undertones in his performance. That makes you drawn to him. His smile lights up the screen and welcomes the viewer and his nuanced glances say so much with out him uttering a word of dialogue. He proves his diversity with this part and I hope to see him take on more of these types of roles in the future. Robertson is also terrific and invites the audience in with her girl next-door charm and demeanor. She commands the screen like a seasoned pro and, once again, proves she can hold her own in an ensemble cast. Unfortunately, the chemistry between the two leads is lackluster, to say the least, and while you can feel their admiration for each other, you don't get the sense of family the film hopes to convey. The first half of the film is interesting enough and evokes emotions, as to keep the audience interested. There is a wanting to know more about these characters that isn't ever explained and the beginning smacks a little like Driving Miss Daisy. Also, the black man cooking and cleaning for the white woman and her child gives the movie an uncomfortable undertone reverting back to slavery. The 1080p High Definition video with the 1.85:1 aspect ratio is very much what you would expect from a Blu- ray. The picture quality is clear and the colors are bright, especially when Charlie walks out in her pink and floral, flowy prom dress. The DTS-HD Master 5.1 audio showcases the beautiful Jazz themed soundtrack and the mix with the dialogue is a nice blend. · Based on a True Friendship –an all too brief and incomplete look at McMartin and her relationship with the real Mr. Church. What starts out as a heartwarming, but tragic, story, loses itself half way through and becomes so much less than it potentially could have been. See the film for Murphy's performance, but go in with an open mind not expecting too much from the film or you will finish being disappointed. Download Mr. Church from the iTunes Store in Digial HD. 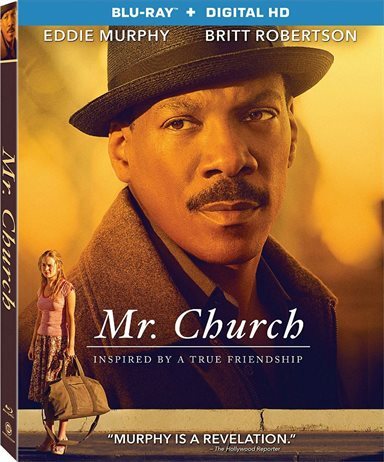 For more information about Mr. Church visit the FlickDirect Movie Database.